The sample also shows data like Average message processing time in milliseconds and Maximum critical time in milliseconds. For a detailed explanation of these metrics refer to the metrics captured section in the metrics documentation. To run this sample, an Application Insights account and instrumentation key are required. Although the sample uses Azure Application Insights, the solution itself does not have to run on an Azure message transport. This example uses the Learning Transport but could be modified to run on any transport. To connect the sample code to Application Insights, the instrumentation key needs to be provided. By default the sample code loads this key from an environment variable called ApplicationInsightKey. Either set this environment variable or paste the instrumentation key in the following section. The instrumentation key can be obtained from the Azure Portal by locating the Application Insights instance, and then navigating to the Properties view. To capture the metric values generated by NServiceBus, a class called ApplicationInsightsFeature is added to the sample. It is responsible for enabling the NServiceBus metrics feature. ProbeCollector ensures that the telemetry probe is subscribed to the event stream. During this stage ProbeCollector is configured and wired. Information such as endpoint name and input queue are passed to allow advanced data analysis in Application Insights. 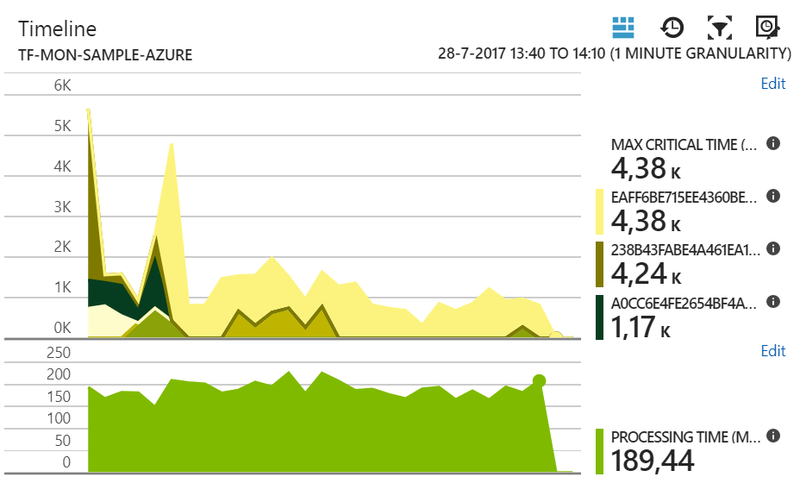 Events and metrics are buffered and the Application Insights telemetry client does this every minute. If the endpoint instance would gracefully stop it needs to ensure that any pending events are flushed to Application Insight. The ProbeCollector is used to pass NServiceBus captured metric data to the Application Insights instance configured earlier. Information passed is added as telemetry context properties, which will be attached to every metric (NServiceBus signal probe) and event (NServiceBus duration probe) captured via the telemetry client. The telemetry client is used to communicate with Application Insights. When the ProbeCollector is registered with the NServiceBus metrics API, it registers observer callbacks to receive probe names, signals and durations. Signals are converted into Application Insights custom events. Durations are converted into Application Insights metrics. To create the charts, metrics provided by NServiceBus, signals, and durations need to be converted into Application Insights metrics and events. The easiest way to setup graphs for metrics in Application Insights is to go to the Metrics Explorer, add a new graph selecting the custom metric of choice and then use the push pin symbol to add it to a dashboard. Maximum critical time & critical time grouped by instance id. Average processing time, not grouped. Minimum hours countdown until Service Level Agreement violation. Similar for events, the following graphs shows all events grouped by event name. This graph can be further filtered, for example, to show failures only. Refer to the Microsoft documentation for more information on creating dashboards from the metrics explorer. Using the metrics explorer is an easy way to get started, but to create truly advanced graphs Application Insights offers an advanced analytics environment.